The PCE-172 Lux Meter is used for accurate measuring of brightness in the industrial sector, commercial sector, agriculture and for research. Mostly, the lux meter is applied for the inspection of lighting of work areas and showcases or used by designers. The lux meter meets all german and international standards for such lighting instruments. The lux meter displays the measured results in the units "lux" and "footcandle". One footcandle is equivalent to 10,70 lux. The instrument determines the max. value automatically when the value is at least 10 µs. 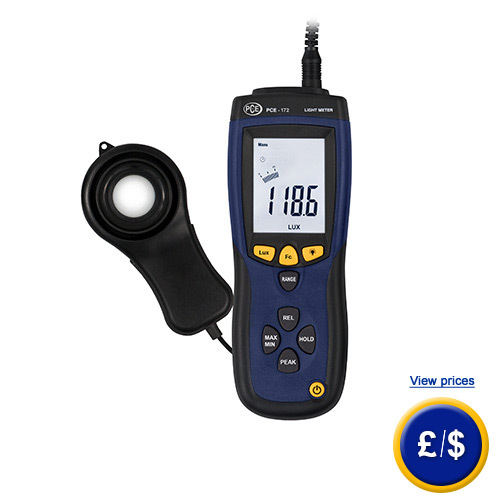 Due to the selectable measuring range, the PCE-172 lux meter offers high accuracy. The handling is very easy, that is why the lux meter can even be used by beginners. When it comes to measuring light, it is important to keep up certain framework conditions. Therefore, distance and angle between lux meter and object need to be set in order to receive valuable results. Here, you will find other lux meters with internal memory, data cable or software for example.Here is a table of minimum values that should be regularly maintained inside, although outside values are substancially higher. The following links show a conversion table for the measurement of lux and a lux meter with similar technical specfications but with neither a memory nor an interface (Lux conversion/Lux Meter PCE-174). Here is an overview of the Lux Meters that we have available.